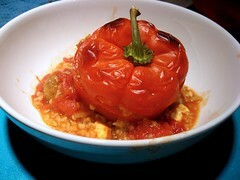 Stuffed Peppers appear to be becoming a staple. They have all of the strengths I look for- they don’t require side dishes, they don’t require a whole lot of work, they’re very versatile, and they reheat really well. Oh, and they taste yummy. Put the rice on to cook, following whatever directions on the package. If it’s Basmati, do remember to wash/soak it. If it’s jasmine, just wash it. Take the sausage out of its casing, and cook it on medium heat. Dice the tofu and add that, it’ll absorb some of the oil and flavor and taste good without adding more fat. Dice the veggies (except for the tomatoes) and add them. I then crushed and added about half of the tomatoes— in the future I might just do them all– in any case, reserve the liquid. Add the rice when it’s ready. Add the paprika and cumin, and then salt and pepper to taste. Wash the peppers well. Slice the top of the pepper off, remove the seed bits. Stuff them with rice. Put them in whatever you’ve got handy– We have a loaf pan, but you could also do this on the stovetop. Add the tomato liquid on the side, add however much extra rice mixture you feel like fitting, and add the chicken stock until it looks full, but not about to bubble over. 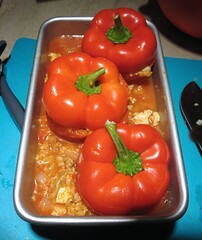 Put in the oven for at least a half an hour (but probably longer), depending on how soft you like your peppers. If it looks like it’s starting to dry out, you can put some foil on top. TaDa! Next time I make them I might try something Middle Eastern- we have a bunch of tabbouleh in the fridge, and seasoned ground beef might be just the thing with some chickpeas.